The gathering, billed as a "white civil rights" rally, is taking place on the anniversary of the Charlottesville violence, which killed an anti-racist protester, Heather Heyer, and took the lives of two Virginia State troopers whose helicopter crashed as they returned from monitoring the day's events. 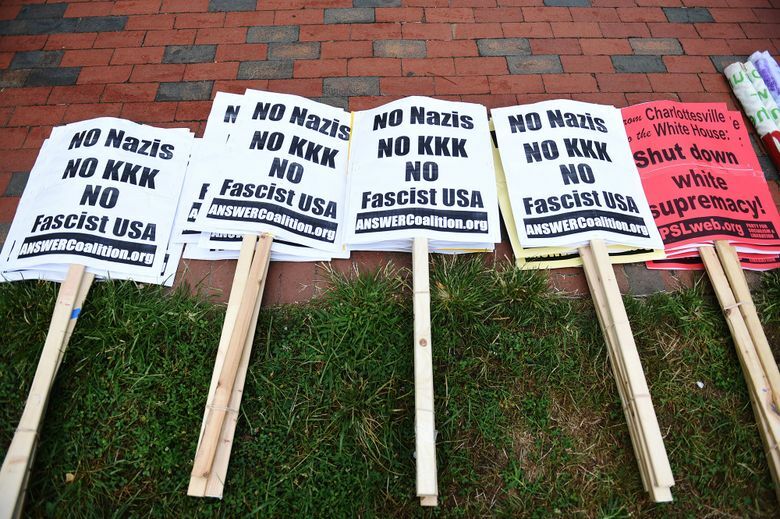 WASHINGTON – White supremacists held a rally in Washington on Sunday, and almost no one but their opponents and the police showed up. Jason Kessler, one of the organizers of last year’s violent and deadly Unite the Right rally in Charlottesville, wanted to hold an anniversary demonstration there, but the city wouldn’t let him. So he brought his show to Washington, where he hoped 400 supporters would join him for a rally at Lafayette Square, across from the White House. Fewer than 40 turned out. The group was met by thousands of protesters who filled their half of the leafy, seven-acre park chanting “Go home, Nazis!” “No Trump! No KKK! No fascist USA!” and “Black lives matter!” They drowned out whatever message Kessler and his small band of followers had hoped to deliver – and that was their goal. 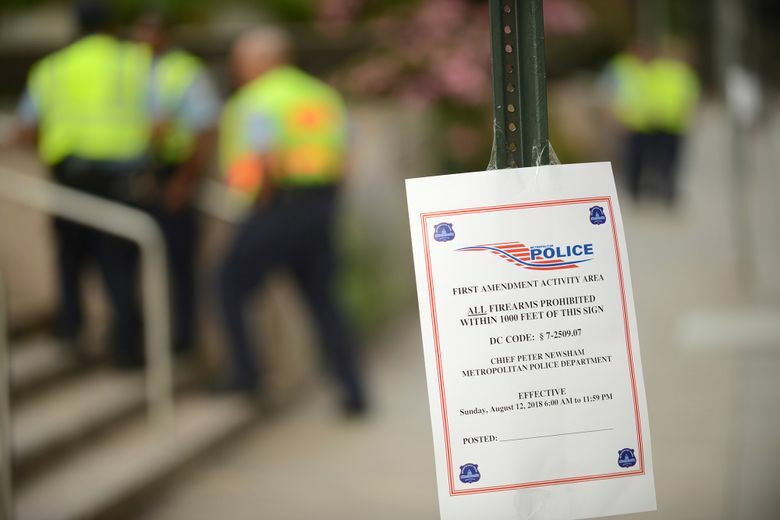 A massive police presence Sunday kept the two sides separated, and outside of a confrontation between some antifa, or anti-fascist, protesters and police long after the rally had ended, there were no reports of violence. Police reported that one man was arrested after he punched a man wearing a “Make America Great Again” hat. 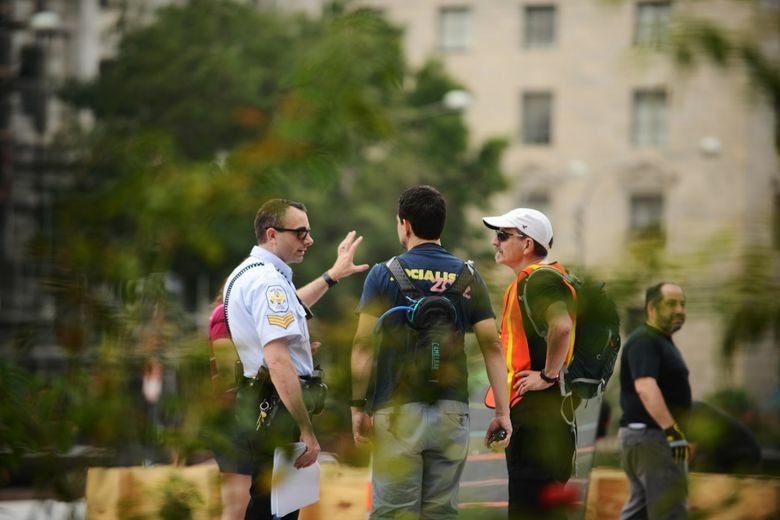 D.C. Mayor Muriel E. Bowser (D) said last week the city would ensure that the rallygoers could exercise their right to free speech – even if what they were saying was distasteful. “While we are opposed adamantly to what we are going to hear, we know what our responsibility is – to protect First Amendment events, to protect Washingtonians and to protect our city,” she said. 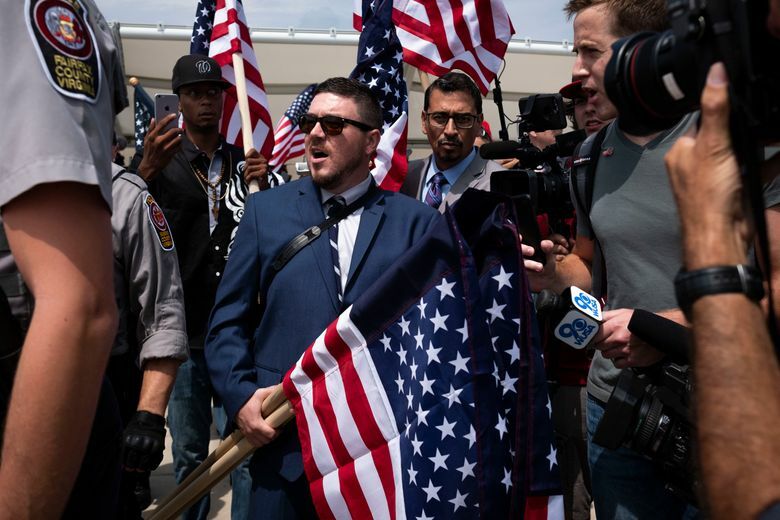 For law enforcement, getting Kessler and his followers to and from the event without incident proved the biggest – and most controversial – challenge. Kessler and his supporters arrived a little before 1 p.m. at the Vienna Metro station where they were accompanied by a law enforcement officers onto the rear car of a waiting train. After disembarking at the Foggy Bottom Metro station, a larger police contingent, including officers on bicycles and motorcycles escorted the group on a walk of several blocks past protesters who shouted and chanted at them. Once inside Lafayette Square, protesters were kept far away from Kessler’s group. Antifa members vented their frustration at not being able to confront the rallygoers by lighting smoke bombs and firecrackers and throwing eggs at federal buildings downtown. By then, a steady rain was falling, however, and the protest was fizzling. Most began heading home, but police kept a watchful eye as the black-clad group carrying umbrellas wandered about knocking over trash cans, chanting “Bust a window!” and yelling at police to get out of their cars and “meet us in the streets.” A confrontation between the protesters and police erupted briefly near 13th and G Streets NW. While police were successful at keeping the opposing groups apart, the effort came at what is expected to be a significant expense to the city for overtime and deployment of law enforcement resources. District officials said late Sunday they were still tallying the cost of the rally to the city. At least some of it would be reimbursed by the federal government, they said, because Kessler’s event took place on National Park Service land. When asked whether he had anything to say to the Heyer’s mother, Kessler offered his “condolences” but said police in Charlottesville should have blocked off the street where she was killed. BLM-GNY – which has been disavowed by the broader Black Lives Matter network – went viral when Newsome and a few others came onstage at a Trump rally in September while staging a counterprotest. “That’s pretty f—– up,” Hyde said. 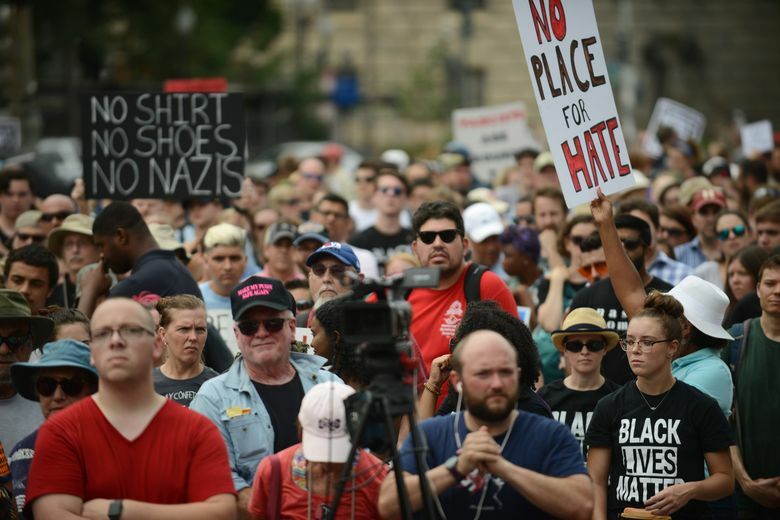 Later that afternoon, when Kessler and his followers had left the park, Khury Petersen-Smith of the International Socialist Organization – which he said brought hundreds of anti-racist protesters to Lafayette Square – called the day a success. The Washington Post’s Hannah Natanson, Teo Armus, Reis Thebault, Peter Jamison, Martine Powers, Michael Brice-Saddler, Fenit Nirappil and Antonio Olivo contributed to this report. The Washington Post’s Hannah Natanson, Teo Armus, Martine Powers, Michael Brice-Sadler, Peter Hermann, Perry Stein, Fenit Nirappil, and Antonio Olivo contributed to this report.